The massive spill spurred a whole generation of activists against offshore oil drilling. Photo Credit: Get Oil Out (GOO) Collection, UCS Library Special Research Collections. In the UC Santa Barbara Library, two exhibits will revisit the spill — one in-depth, the other through art. 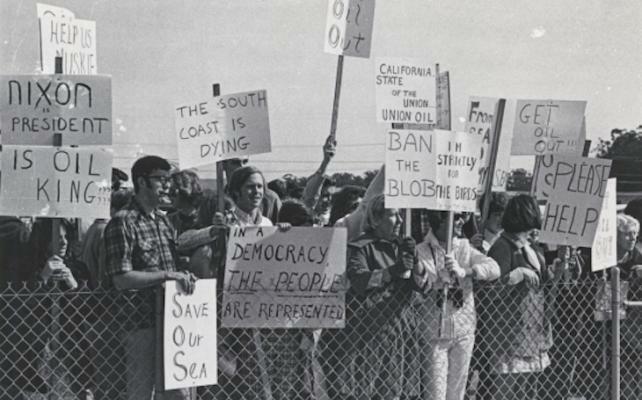 The first, “Anguish, Anger and Activism: Legacies of the 1969 Santa Barbara Oil Spill,” will run Monday, Jan. 28, through Sunday, June 16, in the library’s Special Research Collections(Mountain Side, third floor). There will be a talk and reception with environmental activist Marc McGinnes on opening day from 5 to 7 p.m. It is free and open to the public. Thank you, GoletaTim, for reminding us what really happened. It was really nasty. Thanks for the background. I was very young at the time growing up in Northern California more preoccupied by Bugs Bunny and the Wild, Wild, West than anything else. Well A-21 drilled by Union Oil was not a spill - oil was not spilled because it was never upset or tipped from a container - this incident was a BLOWOUT. Union Oil was drilling at 3479 feet when they hit a geologic formation that held petroleum at over 1000 psi which traveled up the borehole to the surface. This was not a busted pipe. Union Oil did insert a steel pipe, called conductor casing before the blowout when the first 239 feet of rock was drilled through. This casing is inserted to keep the rock in place so it will not fall down the borehole and stops formation water from entering the borehole. Once installed they drilled past 1000 feet and should have stopped and inserted a federally mandated 'surface casing' to 870 feet, to close off more rock and provide for more well control. They didn't and kept drilling past 3000 feet. Without the surface casing they could not control the escaping oil which soon found conduits (faults, fractures) in the rock around the wellbore. Eventually oil and gas was seen bubbling on the ocean surface as far as 800 feet from the original borehole. A massive horrible blowout, not a spill. The Deepwater Horizon rig that drilled the Gulf of Mexico Macondo prospect caused a blowout - not a spill, when the pressure came up through the casing. It was horrible! It got world-wide attention, inspired a national interest in environmental problems, and Earth Day was started here in SB as a result.